Demand control ventilation (DCV), measures the air quality of your home and adjusts the air exchange minute by minute, room by room, based on the actual need. DCV uses humidity as an indicator of air quality. Humidity levels increase as people breath, wash and cook in the home. The principal of operation is a humidity sensitive strip that accurately and consistently opens and closes the vents based on the relative humidity in that room. A central extract fan is located somewhere in the home, typically in an attic or storage area. This fan runs quietly 24/7. 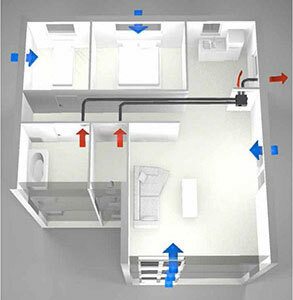 The fan is ducted to the wet rooms such as Kitchens & bathrooms. Extract grills in the ceiling adjust depending on the humidity level to determine the amount of air extracted from each room. Fresh air is then drawn into the house though wall/window vents located in the bedrooms & living areas. These vents open & close depending on the ventilation requirement. No electrical connections or ducting is required for the inlets. The results leave the building with clean air with minimal heat loss. The system is simple and effective and has been installed in more than 3.2 million homes worldwide.